When kids play pretend, it opens up a whole new world in addition to fun. Young ones are often so focused on play time that education can seem like a bore. One of the best things parents can do is offer education in the form of entertainment. In addition to catching the child's interest, it can bring parents closer to their little ones. 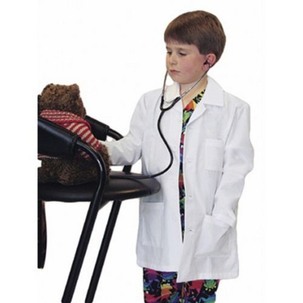 Kids lab coats offer a unique perspective into imagination. When worn, children can delight themselves in pretending to be different jobs. Whether they want to be a surgeon like mommy, or a pediatrician like daddy, kids lab coats can develop an interest in medicine at a young age. www.mylittledoc.com carries different coats and other medical wear, so kids can be like their favorite people. The best part is each coat is unisex and comes in many sizes. 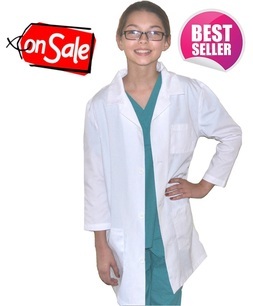 As well as fun dress up, kids lab coats make great costumes for theater, Halloween, and take your child to work day. Children will always desire to mimic adults. They watch everything they do from what they eat to how they act around the house. The same way that a child will learn to eat vegetables from a parent, they will also be inspired to follow in their career footsteps. It's important to always be a positive role model, and with tools to help encourage imagination, children will grow to enjoy academics. Parents playing with their children helps to strengthen an emotional bond. At that point, the accessories to play time become a tool in something so much greater. There's value for little ones when they are connected with their parents or guardians. The pride a child will feel walking hand in hand matching their parent is a grand memory. They will treasure these moments as they finish high school and go off to college. All of their success will have began from the stories of their childhood. So when they get their real white coats, they will commemorate the day they first played pretend. When they walk across the stage to receive their diploma, the parents will remember the toy coat hanging at the back of the closet.